As researchers, practitioners and policymakers gather this week in Vancouver, Canada, for the Fourth Global Symposium on Health Systems Research in Vancouver , momentum for action has never been greater to address the gaps in the global health workforce that prevent universal access to essential health services and stymy inclusive economic growth. In the last 14 months alone, targets on strengthening the health workforce were prioritized in the Sustainable Development Goals, the first ever Global Strategy on Human Resources for Health: Workforce 2030 was unanimously approved by World Health Organization member states, and the report of the UN Secretary-General’s High-Level Commission on Health Employment and Economic Growth presented a robust multisectoral case for urgent investment in the health workforce. To turn the momentum into results, several steps from all levels of policymaking are urgently required –one of the first is a firm commitment to better data on the current state of health workforce, data that is most severely lacking among community health workers. 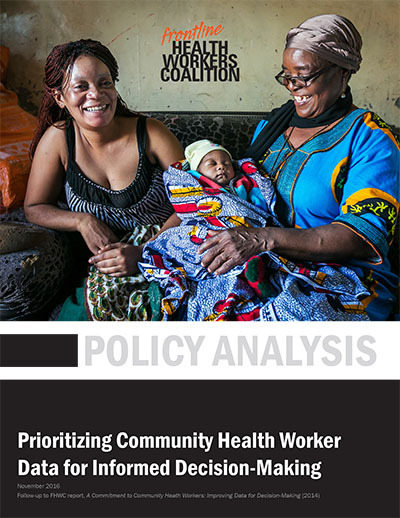 Today, the Frontline Health Workers Coalition (FHWC) has released a new policy analysis, Prioritizing Community Health Worker Data for Informed Decision-Making, aimed at highlighting this acute need for data on health workers on the frontlines of care. This is not a new topic of analysis for FHWC – in fact this report is a direct follow up to our September 2014 report A Commitment to Community Health Workers: Improving Data for Decision-Making. Countries to recognize CHWs as a formal cadre in their national health strategies and to clearly define their roles and responsibilities. Countries to adopt the minimum data set for health workers recommended by the WHO to integrate into their health workforce registries, including National Health Workforce Accounts. Countries to increase investments in mHealth technologies. The International Labour Organization to update its 2008 definition of health workers, including CHWs, to include an updated set of core tasks and competencies. Donors and partners to make coordinated investments in strengthening the capacity of countries to collect and analyze standardized and consistent health workforce data. Discussion of these recommendations will be a crucial piece of a satellite session in Vancouver on Tuesday about the role of non-governmental organizations in ensuring harmonizing CHW programs – an ongoing conversation stemming from the commitment by several NGOs, donor agencies and other stakeholders at the Third Global Forum on Human Resources for Health in Recife, Brazil. We hope you will join us for that discussion and ones to follow. Put simply, ensuring adequate access to essential health services, ensures global health security, empowers women and youth, and promotes worldwide inclusive economic growth. Investing in health workers, including in workforce data collection and analysis needed to address the most acute gaps in access to trained and supported health workers, is a crucial step along the way to ensuring such access. You can read the new FHWC policy analysis at Frontlinehealthworkers.org/CHWReport.